Lovely sunflowers in different colors. Useful for countless designs, including fall themes. Thumbnails of all of the sunflower tubes. 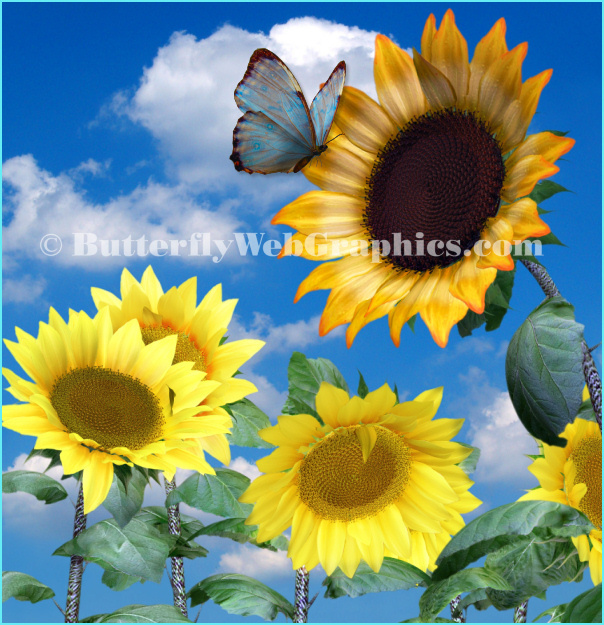 Lots of lovely sunflower graphics for your designs. One of the most beautiful things on earth is a row of golden sunflowers beneath a bright blue sky. In celebration of these glorious flowers and the coming fall, here’s a collection of beautiful sunflowers in a variety of shades from harvest gold to sun kissed red. There are even a couple of dried wilted sunflowers, which would be great for autumn and Halloween designs. I’ve also included the seamless tile seen on this page. There are two more seamless tiles in this package. Sunflowers are so cheerful and heartwarming that they would be great for countless projects all through the year. From scrapbooks to web designs to scene making, these sunny blossoms would be the perfect embellishment or addition. I’ve used these sunflowers in many projects through the years and count them among my favorites. I love to add them to my autumn background scenes. There are 33 royalty free, high-quality clip art PNG images in this package. All of these images have transparent backgrounds (except for the two backgrounds) making it easy for you to use them as tubes or nozzles–or merely to drop into your design. The size of these images varies, but they are approximately 1200 X 1800+ pixels. All are 300 DPI, making them great for print projects. Members can use the tubes for personal or commercial projects, including web design, template design, graphic design, t-shirt design, candy wrappers, scrapbooking, and for signature tags, but please read my terms to learn more. If you have any questions, please email me. This package is one zip file, which is about 38 MB.